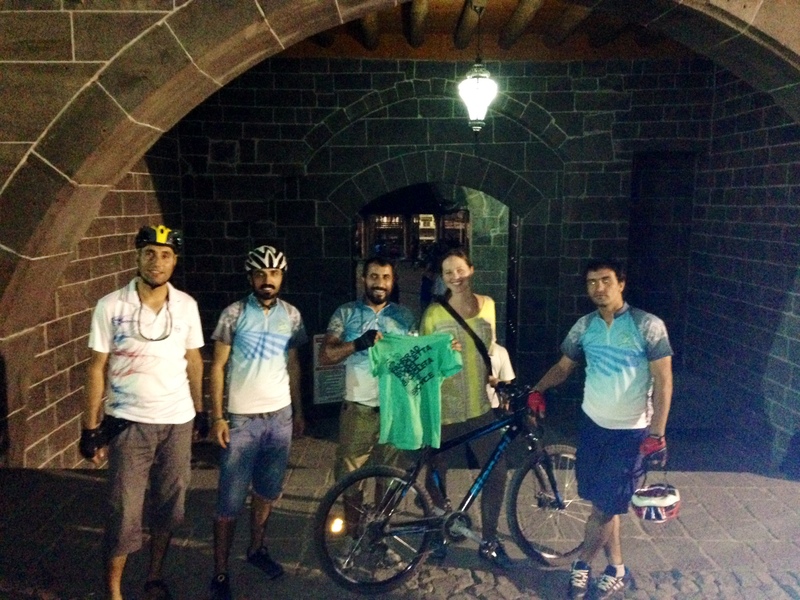 On an urban bicycle tour with bicycle advocates of Diyarbakir Bicyclet. Open city streets and apartment buildings on-the-rise make up much of contemporary Diyarbakir. And the city’s outskirts are lined with dirt patches that marking future construction project. Five years from now, the city will be worlds away from where it was five years ago, for more reasons than one. From what I can tell, quite a few of the buildings popping up are fairly luxurious apartments. Slums are interspersed, but the sheer number of new buildings under construction seem to reflect high demand. It’s an interesting contrast to the ancient city walls, restored in 381 AD by the Roman empire, that remain at the city ‘center’ overlooking the Tigris river. I wonder how much this development has to do with recent war and present cease-fire between the Kurds and Turks in Turkey. I wonder many things about how fighting in the region affect what’s happening in this Kurdish capital, but my many questions from my short six days in Diyarbakir are for a different conversation (which you can read here). This is a story about bicycle advocacy and Kurdish ecology activists. I figured connecting a foreign place with something I knew was a good place to help making it feel a bit more comprehensible. I’ve done some bicycle traveling and work in bicycle advocacy in San Francisco, California, so imagine my excitement when warmshowers.org and David Kroodsma’s Ride For Climate led me to discover Diyarbakir Bisiklet, a group of bicycle advocates who regularly promote bicycling as transportation in eastern Turkey. (Side note: David Kroodsma did some qualitative research on water issues and climate change during his trip through Asia, and here are some of his thoughts on Climate Change in Diyarbakir). So back to Diyarbakir Bisiklet. Their driving factor is ecology, and they promote the bicycle as transportation for environmental reasons – riding a bike is much less polluting than driving a car. This is great for me, as someone who likes to start with a conversation about a bicycle and stem out from there. Four of us met for tea at a colorful local cafe called Karga, where everything in the space was deliberately built or decorated by local friends and artists. Two hours flew by as we compared bike projects from our opposite ends of the world, and we spoke about potential collaborative projects that might be able to happen between San Francisco and Diyarbakir but didn’t come up with anything concrete. We did trade a Diyarbakir bicycle shirt for a San Francisco bicycle shirt, an exchange that I’m still pretty excited about. Diyarbakir Bisiklet’s facebook page boasts 2,377 members at the time of this blogging. Many of those are inactive, but the organizers take it as a sign of support and the growth of awareness of bicycles as a mode of transportation. Diyarbakir is a city with wide roads and few followed traffic laws – pedestrians never have the right of way and traffic lights are merely suggestions. The width leaves plenty of room for building bike lanes, however, and the organizers have been working with the local municipality to start building 75 km of bicycle paths. There’s a good relationship there, since the local municipality wants to (1) build an ecologically-friendly transportation system while (2) easing traffic congestion and the like. Their bicycle trip from Turkish Kurdistan to Iraqi Kurdistan is perhaps their most interesting activity to me. In 2013, the Diyarbakir Bisiklet group rode 850 km from Tunceli in the Darsim province of Turkey to Erbil in the Kurdish Autonomous Region in Iraq. At any point during their 16-day trip, they rode with 12-25 cyclists. They received funding from local municipalities such as Darsim, Batman, and Şırnak. The Diyarbakir municipality gave them some money, a car, and food. When they crossed the Turkish border and arrived in the Kurdish Autonomous Region, the Kurdish government gave them three cars and a soldier for added safety, and put them up in a hotel. I’ve been impressed by the support this group was able to garner from the local towns along the route in both Turkey and the Kurdish Autonomous Region in Iraq. A map pointing out starting and end point of Diyarbakir Bisiklet’s 16 day, 850km awareness-raising bike tour from Tunceli to Arbil in 2013. I asked them each what left the biggest impression on them from that trip – they all had the same answer. The “soldiers of ecology,” they called them, in the Kurdish Autonomous Region was a special governmental team in the area to protect the environment. (keep in mind language barrier might color my understanding of what this meant). This kind of protection, I’ve been told, doesn’t currently exist in Turkey. Their overarching goal of the trip was raising awareness about contemporary environmental issues, one being the Ilisu Dam project in Hasankeyf that will submerge historical sites, affect wildlife, and cause 35,000+ people to be relocated. The dam is facing a lot of resistance from local people and large environmental groups such as Doga Dernegi, but the Turkish government is still doing what they can to push ahead. Right now, the core members of Diyarbakir Bisiklet ride bikes through the city every Friday night to increase awareness about people biking as transportation. My San Francisco-colored mind flashes to Critical Mass and Bike Party when they mention this. As per future projects, this fall they’re starting a campaign against bottled water, educating people in Diyarbakir on the negative effects on both on health and the environment. They also have some urban gardening projects going on, and (I think) would like to expand that or learn more. Next, they’d like to work with students to teach them how to bike in city streets, calling to mind our Bike to School projects and Urban Bicycling Classes here in San Francisco. Ideally, they’d also like to collect bikes and give them away to students. This would be a huge deal since cars still dominate the road, and bicycles are definitely perceived as being in the way of traffic rather than being traffic. There’s a long way to go to shift perceptions, but that does not mean efforts are wasted. To that end, they’ve already trained 25 women in bicycling, some of whom are now riding with the group in multi-day bicycle tours to raise awareness about various ecological issues. A big deal, especially, since bicycle-riding (and traveling around autonomously) is predominantly viewed as a male activity there. For bicycle travelers, they’d like to build a safe space with a warm shower and a kitchen where the travelers can feel safe camping. Mention of that brought me back to my own bike travels through the rural town of Twin Bridges, Montana, where a dedicated Bill White built up a beautiful donation-based camping space along the river for tired and dirty bicycle travelers to clean up and reset up.